ULC purchased Mile High Vista in 2011 through Denver’s Transit Oriented Development (TOD) Fund. For the first time, ULC acted as master developer of the 2-acre parcel. As master site developer, this process included the remediation and infrastructure for the entire property. Construction started in November 2011. In addition to the Rodolfo “Corky” Gonzales Denver Public Library, ULC also developed the Avondale Apartments. These 80 units of affordable housing include commercial retail space on the ground level. At the present time, future plans for the remaining parcel of land on the site is underway. In the meantime, we are evaluating the feasibility of constructing affordable for-sale housing. 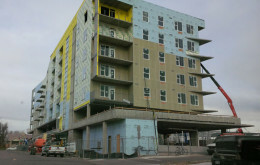 With proposed tax cuts for transit and housing programs in the 2018 federal budget, Rail~volution explored the Mile High Vista transit-oriented development in West Colfax to showcase the importance – and challenges – of a successful housing development near transit. The Rodolfo “Corky” Gonzales Library is located in West Denver, and gained significant community support since opening its doors in 2015. The library sees over 130,000 visitors each year, and offers a range of programming to meet a variety of needs. West Colfax is getting a new Denver Public Library! Infrastructure improvements have begun as of November, 2011 so the construction of the new West Denver Public Library on West Colfax can begin.